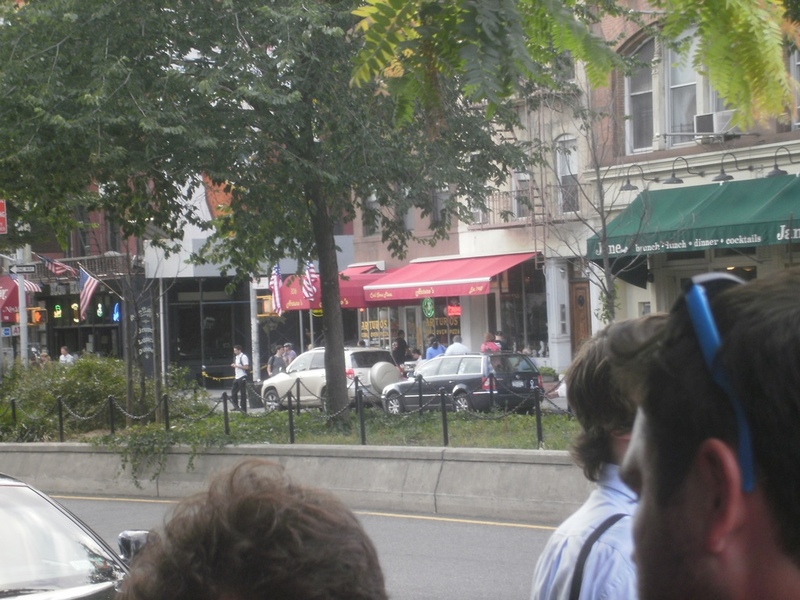 07/17/2011 – Scott’s Pizza Tour of New York City! First of all, this is Scott! A guy who knows his pizza! 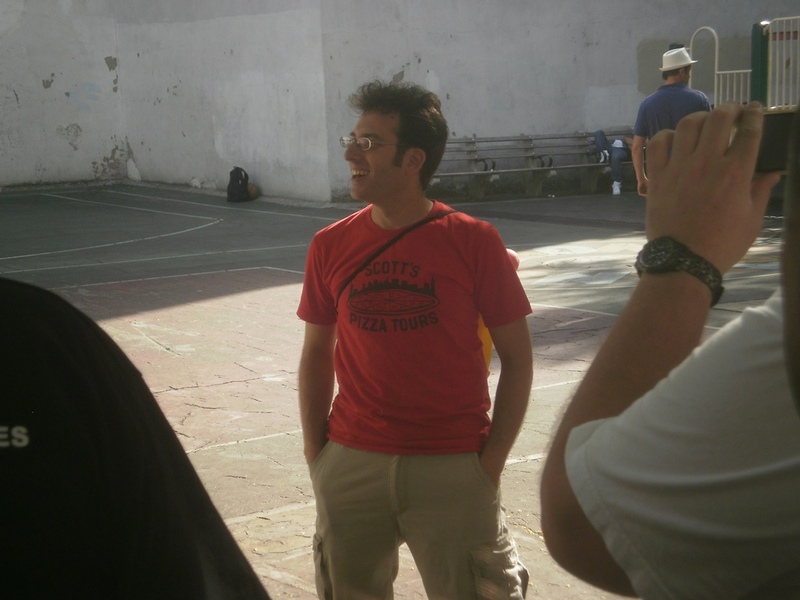 He provided our group with a lot of historical background about the origins of pizza, how it became a huge hit in the United States, and even the difference of the experience of eating a New York style Pizza vs. a Chicago Style. Needless to say, when on one of his tours, you will know more about pizza then you thought possible. 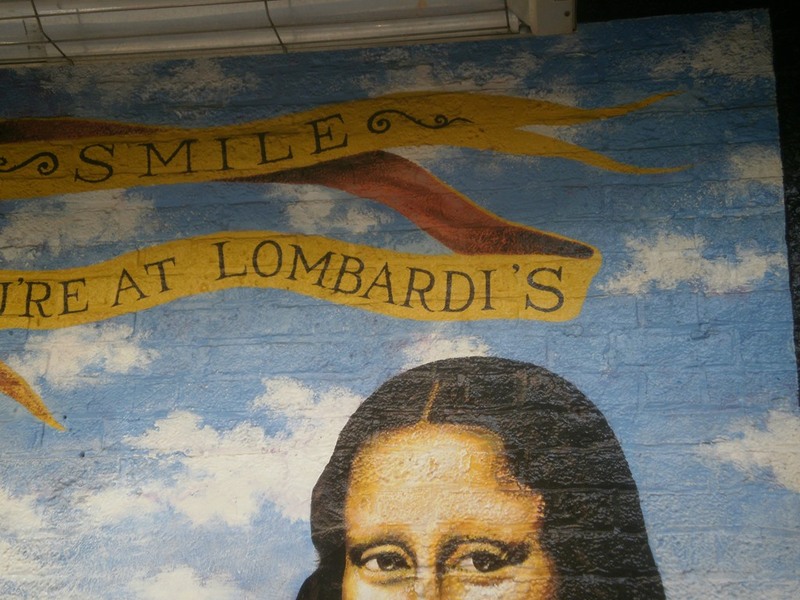 So after introductions and our history lesson about the pizza, we were taken to our first pizza restaurant destination…Lombardi’s! 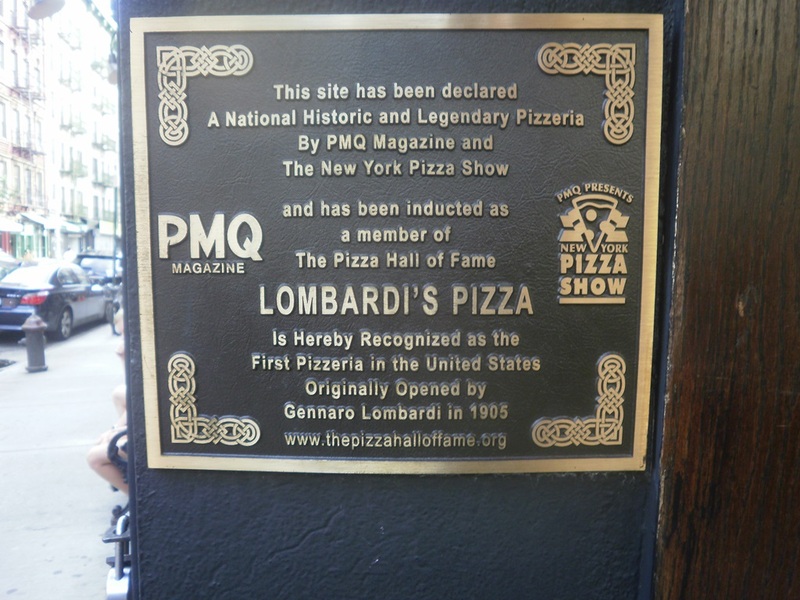 Reading the plaque pictured above, as well as based on what Scott told us, Lombardi’s is recognized as being the first pizzeria in the United States. 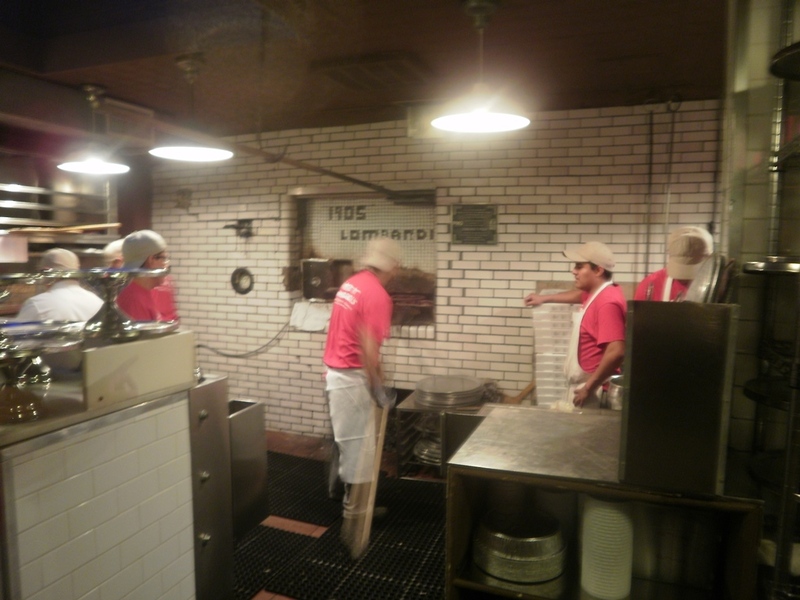 One of the neat things that Scott was able to arrange for us was to get a view of the oven that is used for Lombardi’s. What I did not realize is that the temperature of the oven has such a huge effect on the way a pizza cooks and how the finished product is. 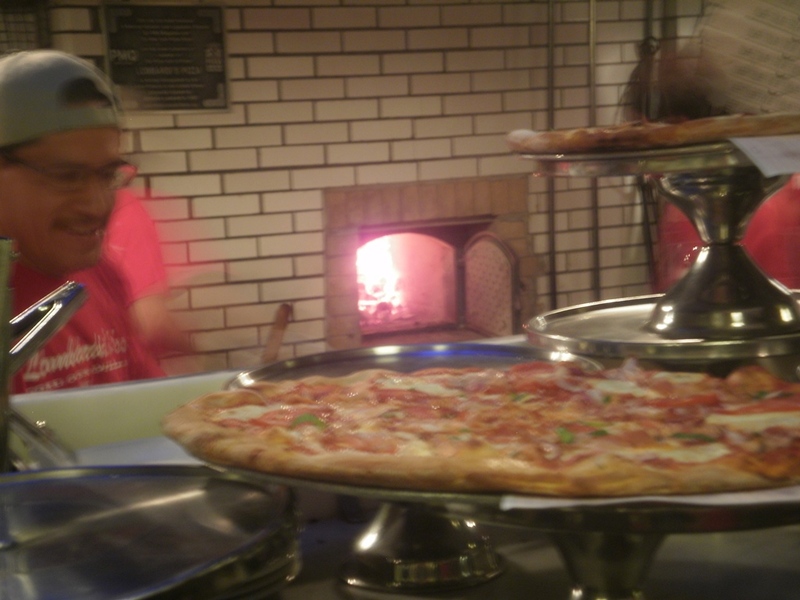 Higher temperatures tend to be used for often for thinner pizzas (like those very popular in New York), and thicker pizzas are generally cooked at lower temperatures for longer periods of time. 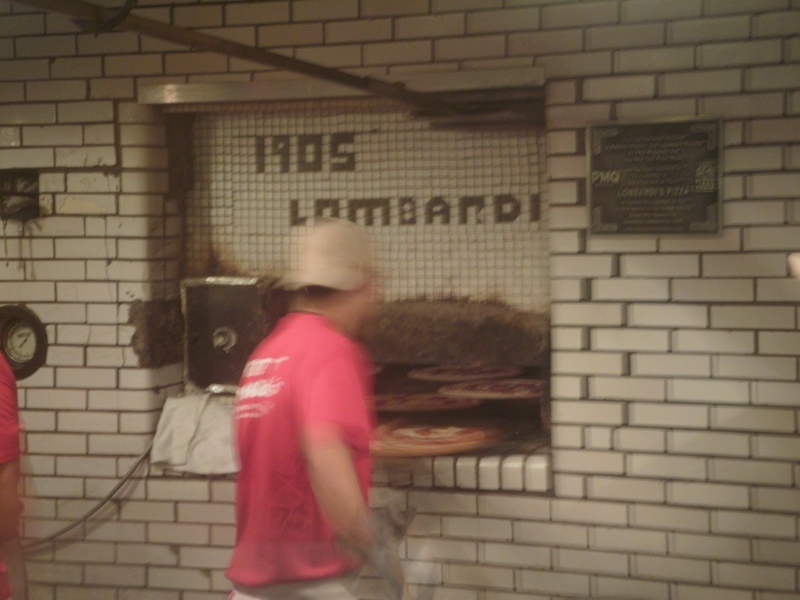 Lombardi’s uses a brick oven that can get as hot as 800 degrees Fahrenheit! And with a red-hot coal fire like that, you get a nice looking pie such as the one seen here! Doesn’t this slice look great? It sure tasted great! 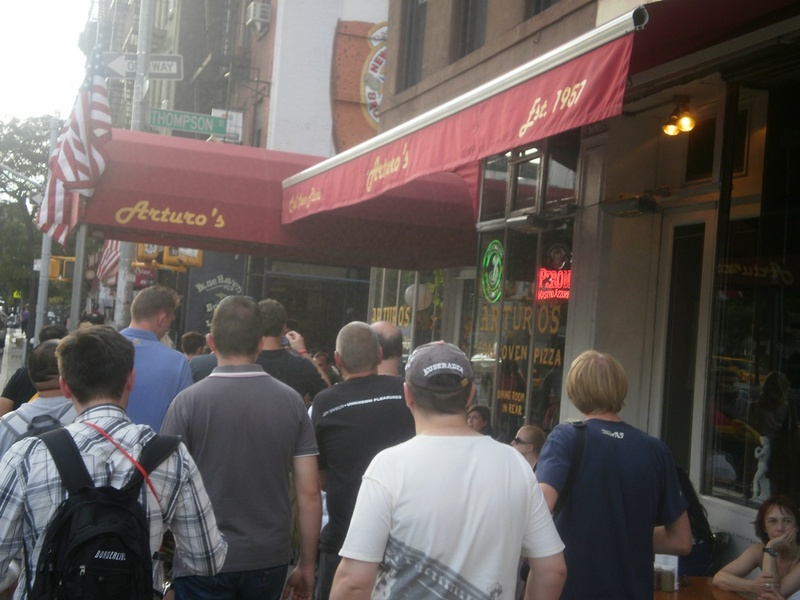 So after having an opportunity to sample Lombardi’s, we took a walk down the street a little ways to our next stop, Arturo’s. Now it has been a couple of years since I was on this tour, but I want to say that it was at this point where Scott explained the difference of using fresh mozzarella vs. aged mozzarella. 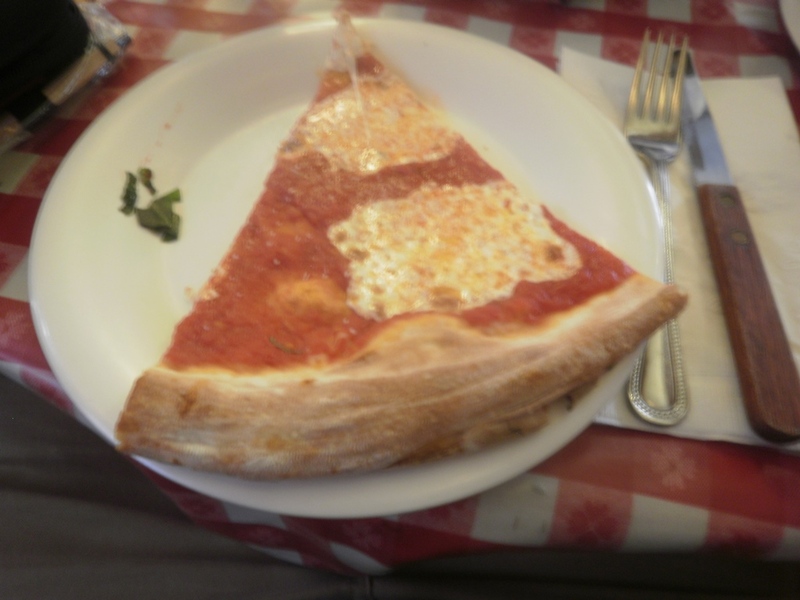 At Lombardi’s they used fresh, which is typically pulled apart from a ball and laid out onto the pizza, whereas aged is what they use at a lot of chain places where it is shredded up, and scooped then spread on top. My memory says that Arturo’s used aged mozzarella, but looking at that delightful pie, it makes me think that they too may have used fresh. Either way, Arturo’s was also an excellent place! 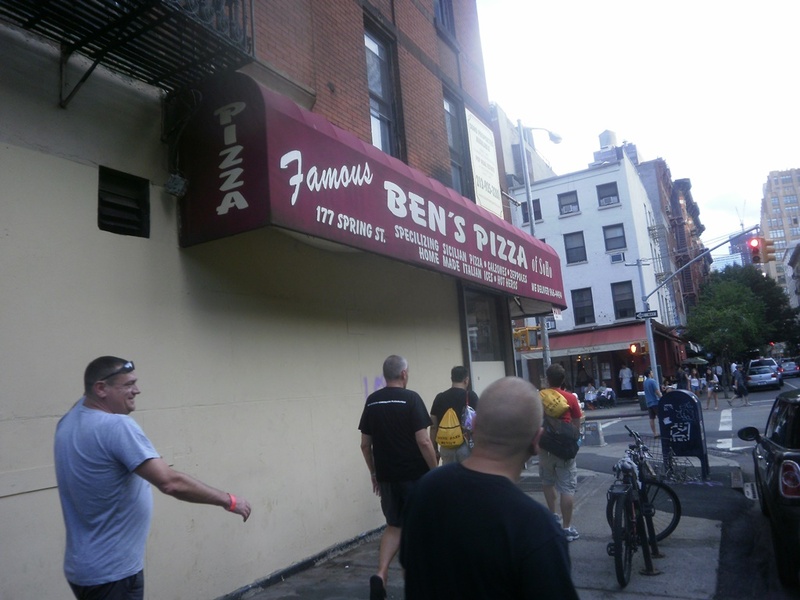 The third stop is a wildcard for every tour as Scott will change it up for a variety of reasons, but for our group he took us to a place called Ben’s, which was more of a counter service place than the first two restaurants we stopped at. (Sorry, but I couldn’t find any pizza pictures in my archive). 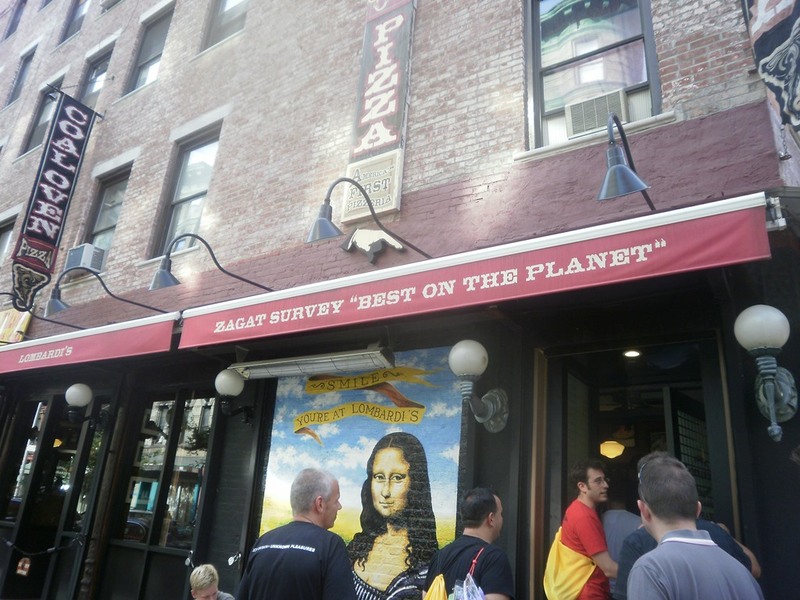 So if you ever find yourself in NYC, and would enjoy something that is unique and will please your taste buds as well as a pizza craving, definitely checkout Scoot’s Pizza Tour! 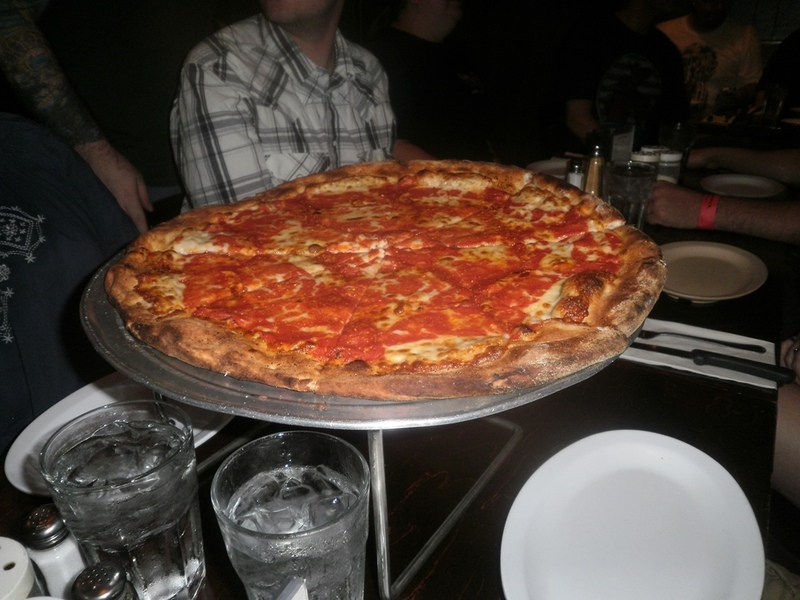 It was a great experience and one that I feel has only further influenced my own personal love of pizza.